Shelley Doucet capped off an impressive season this weekend at the World Long Distance Mountain Running Championships in Premana, Italy. The race was 32km in length and featured 2900m of elevation changes, largely in three major ascent and descents. Only two weeks after winning the Francophone Games, Doucet returned to the international stage to compete an impressive 9th place finish in her first major mountain running competition. Despite the wet and rainy conditions, Doucet ran with confidence from the gun. She was in good position from the first climb, staying in about 4th or 5th on the first ascent. After 19.6km she was in 7th position and still running strong. She found the wet, technical descents to be challenging, but she utilized her exceptional fitness to keep her in contention throughout the race. Marianne Hogan was the second Canadian at the championships and finished in the top 20 for the second year in a row. She improved on her 20th place position in Slovenia last year with an 18th place finish. Hogan ran with her quintessential optimism and enthusiasm throughout the race, and used her descending abilities to her advantage. She passed a couple of female competitors (and a number of the men as well) on the final descent to move up into the 18th position. Lisa Heidt was the final scoring Canadian in 36th position in her first international mountain running competition. She maintained a steady position throughout the race and held strong through to the finish. Natalee Peeters rounded out the Canadian team in 48th position, despite facing some adversity prior to the race. She missed her connecting flight in Toronto on the way to Italy, and arrived in the Premana area less than 18 hours before the competition. 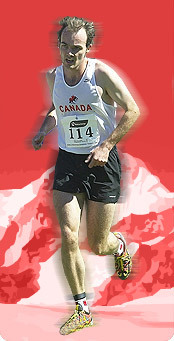 Matt Setlack was the top senior male Canadian in a world mountain running competition for the second weekend in a row, improving three spots to 53rd this week from his 56th place finish in the World Mountain Running Championships last weekend. Setlack felt last week's race in his legs which made the final kilometres challenging, but he nonetheless held on to finish just outside the top 50. Setlack only registered for the World Long Distance Championships shortly before the race. It was his first multi-hour mountain race. Expect Setlack to be a force to be reckoned with fresher legs and more careful fuelling. Greg Smith had a difficult race, having struggled with a serious knee injury before the race. His injury made it extremely difficult for him to descend, which was a major component of the race. Impressively, he toughed it out to the finish, which was an accomplishment in itself. For the second weekend in a row, team Canada is in Premana, Italy for an international mountain running competition. This weekend it's the 14th World Long Distance Mountain Running Championships. Last weekend, team Canada had a solid performance at the World Mountain Running Championships, with two tenth place team finishes for the senior women and junior women. The Canadian women look to continue their success in the long distance championships this weekend. Shelley Doucet has arrived in Italy only shortly after winning the Francophone Games marathon in the Ivory Coast two weeks ago. Marianne Hogan is running for the Canadian mountain running team for the fourth time in three years, having competed at the World Mountain Running Championships in 2015 and 2016 and in the World Long Distance Mountain Running Championships last year. Natalee Peeters and Lisa Heidt qualified for the team with excellent performances at the qualifying race in Vernon, BC in early May. Matthew Setlack will be racing for Canada for the second weekend in a row. A late addition to the men's team, he elected to compete for Canada after a successful race as top Canadian at the World Mountain Running Championships last weekend. He has the benefit of being familiar with the challenges of the trails in the area. Greg Smith is a seasoned mountain runner with ultra running experience who is based out of the Portland area.